Otherwise, start or continue Shopping below by using the 'Add to Cart' buttons. call for Trade and bulk prices. How much will I need - Click for Help page. How much solution will it make for two coats? 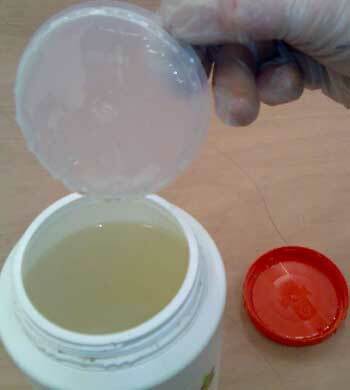 Double the powder weight for 10% solution. 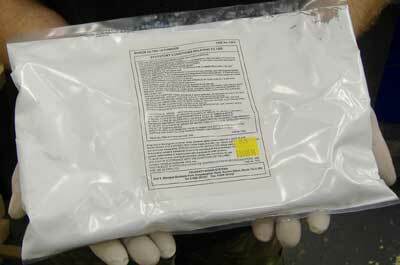 Packaging - in heat sealed plastic bags or in plastic bottles, pre-diluted or ready to add water. 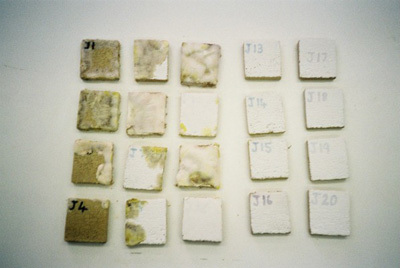 Dry Rot Dilution - 1kg dilutes in water to make 25 litres of Dry Rot treatment at 5% concentration, 12.5 litres at 10% concentration. Application rate - an average rate of 4 sq metres per litre, until wet. Apply 2 to 4 coats, allowing surfaces to dry in between coats. How much will I need for Dry Rot treatment - click for Help page. 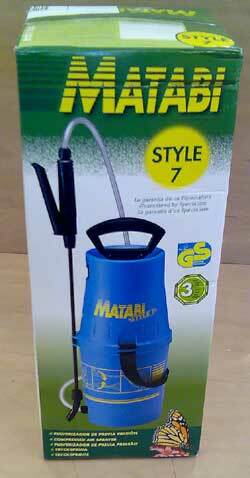 Unique features - no smell, no staining, carpet friendly, no solvent, no micro emulsion, no Permethrin or Cypermethrin. Amateur use - when diluted at 5%. Professional use - when diluted at up to 10%. How much will I need for Dry Rot - Click for Help page. Professional use option - when diluted at 10%. Application rate - an average rate of 4 square metres per litre, until wet. Apply 2 to 4 coats, allowing surfaces to dry in between coats. Typically it is used on floor joist ends and bearing areas, damp roof timbers, backs of skirting boards and architrave's, back of door linings, cut ends of new, pre-treated timbers. Amateur use - supplied at 5%. 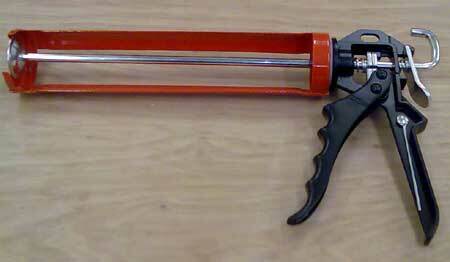 Professional use - supplied at 5% and 10%. Application rate - an average rate of 4 square metres per litre, assuming smooth surfaces. 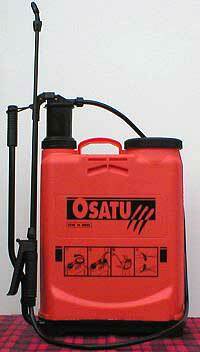 For woodworm treatments 500cc will cover about 2 square metres, 1 litre about 4 sq metres and 2 litres about 8 sq metres. Re-entry time - 1 hour, or until dry, whichever is the longer. Remove all excess using a damp cloth after 48 hours, if the gel has not all been completely absorbed and the treated surfaces are to be left exposed. Wood varies in its ability to absorb products. Dry Rot Paste being injected into a 10mm hole. or call 01626 331351 and we'll calculate your exact requirements. Click for Death Watch Beetle Treatment advice - or call 01626 331351. Unique features - no smell, no staining, carpet friendly, no solvent, no microemulsion, no Permethrin or Cypermethrin. 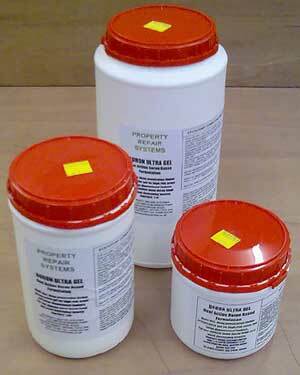 Safety benefits - no brain toxins (Permethrin and Cypermethrin), no damage to roofing breather membranes (Microemulsions). 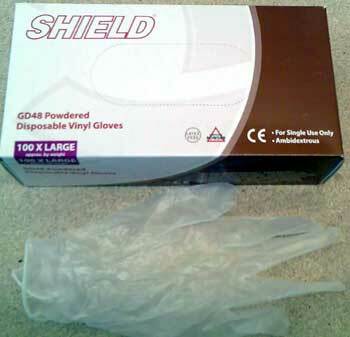 Professional use - supplied at 5% and 40%. leaving at least 15mm of wood at edges and hole bases. or call us on 01626 331351 and we'll calculate your exact requirements. electricity poles & railway sleepers. Using directly from the plastic bag. e.g. outdoors, ground touching timbers, fence posts, window frames, lintols, door frames. Safety benefits - no brain toxins (Permethrin and Cypermethrin), no smell or vapour. Often used in window frames, timber frames houses, structural beams, garden posts and railway sleepers..
least 15mm of wood at edges and hole bases. untreated on left, painted with Dry Rot Paint on the right. Note - no Dry Rot grew on the painted panels. 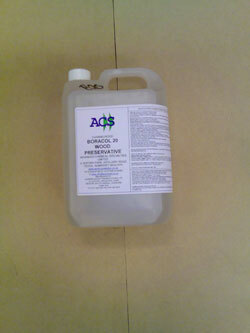 Apply two coats, allowing surfaces to dry in between coats, at an average of 4 - 8 square metres per litre, per coat. This coverage will vary considerably with surface texture (e.g. bare brick, concrete, plaster, wood). a fungicide which is incorporated in the paint film when it dries - amazingly Rot will not walk across this coating! 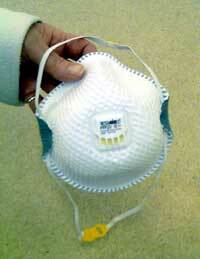 Safety benefits - no smell or vapour. Typical usage - in and around a dry rot treatment area to contain possible re-emergence. It stops spread even if dry rot is reactivated by damp. Often used frames, frame linings, skirting boards. Dry Rot barrier paint is used in conjunction with Boron based spray, gel and injection treatments, not as a substitute. Always look for and eliminate the moisture source of all Dry Rot attacks. Choosing a product type - always check with our experts if you are not sure which product is best for your job, call 01626 331351. 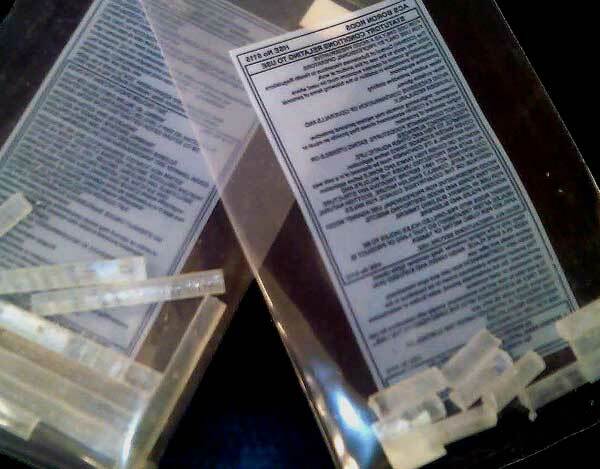 The Fugenex Dry Rot Sensor Kit contains 8 treated sticks with plastic caps. turning the dye to yellow, initially in patches or blotches. 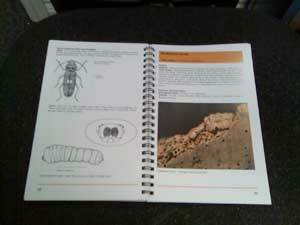 Identifying Wood Boring Insects, Rots and Moulds: full colour: BRE 'Bible' for insect and rot identification. 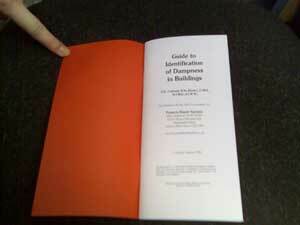 Identifying Dampness in Buildings: Coleman - Authorised Reprint. Become your own Expert on damp, using this is definitive, easy to read guide to all dampness problems. it is processed over a secure connection on secure servers. We use Secure Socket Layers (SSL) to encrypt all information you provide before sending it to our servers. SSL is the industry standard and the best software available for secure ecommerce transactions. Use any of our Shopping Pages to place goods in your Shopping Cart. They all use the same secure Shopping Cart system.